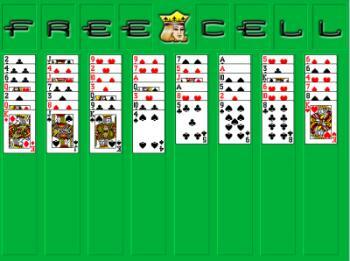 The object of FreeCell is to move all the cards to the home cells, using the free cells as placeholders. To win, you make four stacks of cards on the home cells, one for each suit, stacked in order of rank, from lowest to highest. The game area consists of four freecells, four homecells and a deck of cards, which is dealt face up in eight columns at the beginning of the game. To move a card, click the card you want to move, and then click where you want to move it. 1. A card from the bottom of a column can move to a free cell. 2. A card from a free cell or from the bottom of a column can move to a home cell. Moves to a home cell must be made in order of lowest to highest, same suit. 3. Aces can move to an empty home cell. 4. A card from a free cell or from the bottom of a column can move to the bottom of another column. Moves to a column must be made in order of highest to lowest, alternating suit colors.